When you start recording a macro, the Record Macro dialog box appears shown in the following figure. 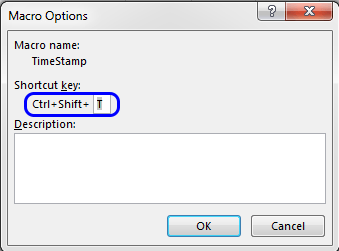 You can provide a shortcut key for your macro in the Shortcut key field. Choose Developer ➪ Code ➪ Macros (or press Alt+F8). The Macro dialog box appears. Select the macro name from the list. Click the Options button. The Macro Options dialog box shown in the following figure appears. Specify the shortcut key. Use a single letter (for a Ctrl+letter shortcut), or press Shift and enter an uppercase letter (for a Ctrl+Shift+letter shortcut). Click OK to return to the Macro dialog box. Click Cancel to close the Macro dialog box. 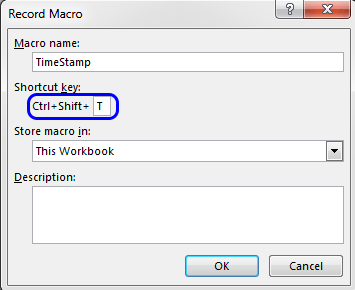 Use the Macro Options dialog box to add or change a shortcut key for a macro.